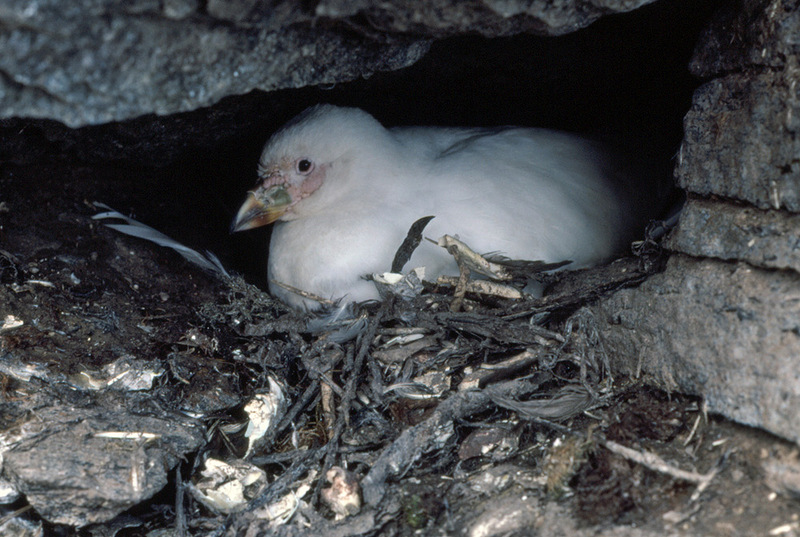 Breeding Season: Arrives at the breeding grounds in October to November, nests are made in the shelter of rocks and eggs laid in December to January. Feeding & diet: Opportunistic feeders who will eat just about anything even vaguely edible they come across, they aer often found foraging along shorelines and amongst washed up seaweed for invertebrates. They are frequently found around sea-bird colonies during the breeding season, especially penguin colonies where they will eat eggs, chicks, carrion and even fresh faeces. They do not kill other birds but will try to interrupt chick feeding and steal the spilled food. Distribution: From the Antarctic Peninsula and throughout the Scotia arc through the South Shetland, South Orkney and South Sandwich groups to South Georgia and associated islands along the way. It migrates to the Falklands and coastal regions to the south of South America but mainly breeds on Antarctica and its islands. 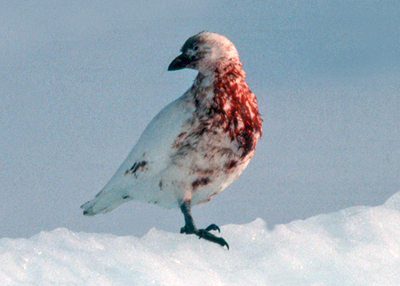 What are Snowy Sheathbills like? Sheathbills are also sometimes referred to as "Mutts" supposedly after the mutt-mutt-mutt sound they make, though it does also just seem appropriate, or paddies in the Falkland Islands. They are the "bin men" (garbage disposers) of the Antarctic. Sheathbills are so called because of the horny sheath that covers the upper part of the bill. They will eat just about anything that they can lay their beaks on, the one in the picture to the right had been feeding on (in) a dead seal. They frequently scavenge penguin colonies for eggs, dead chicks, even penguin faeces - there's occasionally some not fully digested food there. 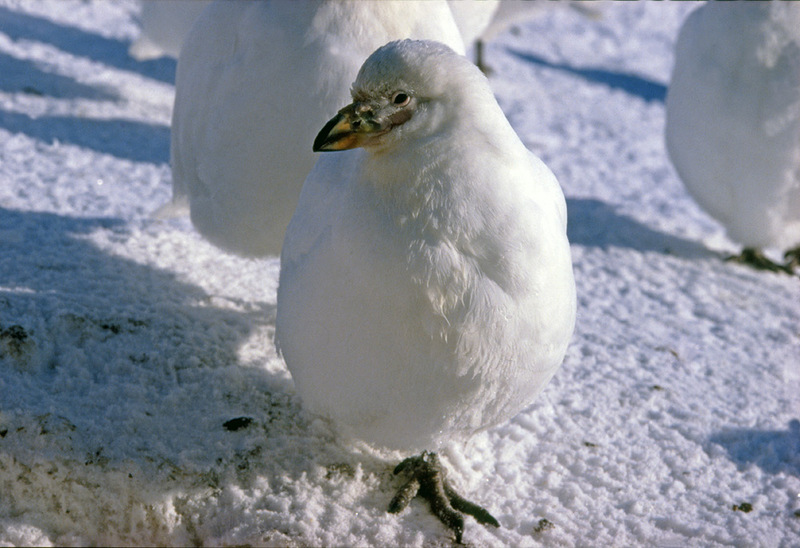 They are the only Antarctic bird species that don't have webbed feet and so are not able to fish for food like the others. They usually stay out of the path of the sea-ice and move north in the winter when the worst weather comes. 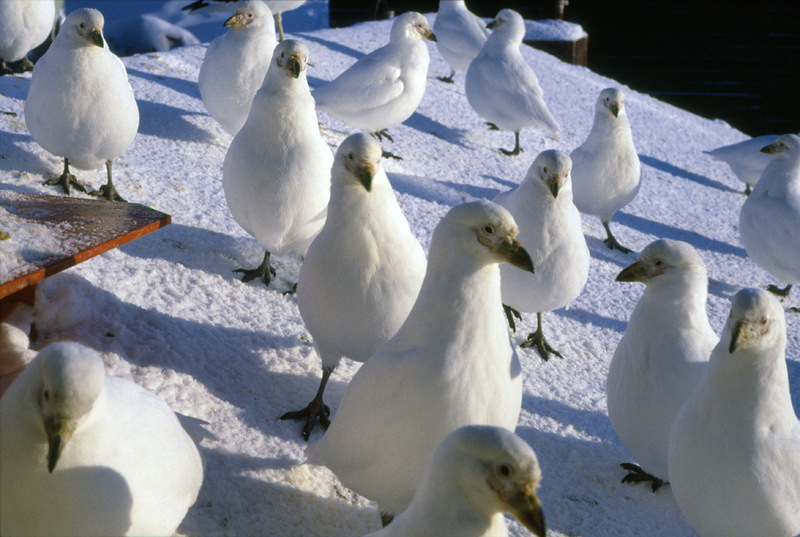 The picture at the top of this page however was taken in mid-winter at a temperature of minus 30 centigrade of one of a small colony of sheathbills that lived around the base on Signy island in the South Orkneys group. Whereas most of the other sheathbills would move north, this hardy group evidently thought that there were enough scraps available from the base to make staying worthwhile. Surprisingly hardy creatures, the bird in the picture has its feathers fluffed out as far as it can and is considerably skinnier than the picture shows. 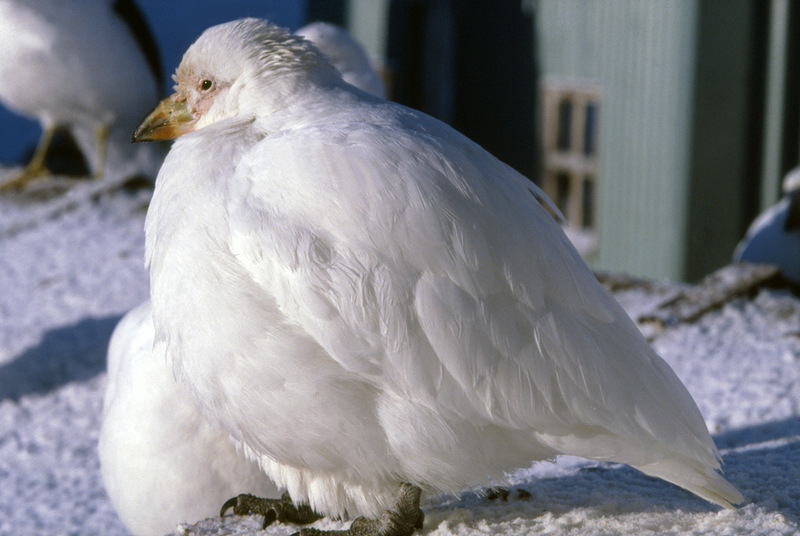 In an attempt to try to reduce heat loss sheathbills will hop around on one leg rather than risk getting two cold. This made landing rather exciting as they found out the hard way that this is really a two legged activity. Frequent falls down small holes were another hazard as their one leg went between slats on the wooden decking of our small jetty. In fact so determined were they to not use both legs and so clumsy in the process, that for a while I was convinced that there was actually one unfortunate individual that really only had a single leg, as it would hop away rather frenziedly if it was in your path rather than put the other leg down or fly. Not exactly a good looking bird and very nervous and skittish as befits a small and vulnerable creature that makes its living by scavenging, it was difficult not to have some respect for Mutts as they braved the harshest of conditions and seemed to know their place in the hierarchy - right down at the bottom. Pictures above, sheathbills - waiting for kitchen scraps outside the kitchen window in winter. With no skuas around in the winter months, these birds that live around an Antarctic scientific base can actually get to the best supply of food around at this time. They accumulate around meal times drawn to the smells coming from the kitchen waiting for the "gashman" to start clearing up and hopefully throw some tasty morsels in their direction.